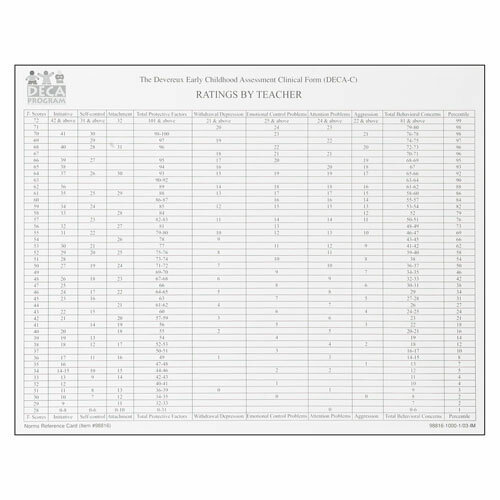 The Norms Reference Card shows the ratings by teacher on one side and the ratings by parent on the other side for easy comparison. 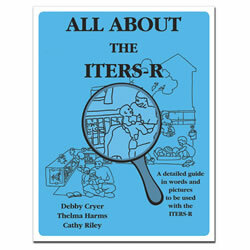 T-scores, Initiative, Self-Control, Attachment, Total Protective Factors, Withdrawal/Depression, Emotional Control Problems, Attention Problems, Aggression, Total Behavioral Concerns and Percentile are the areas reviewed on the card. 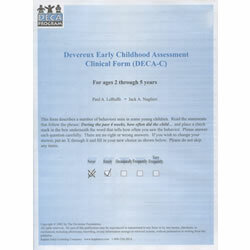 The Devereux Early Childhood Assessment-Clinical Form (DECA-C) is an assessment of resilience in preschoolers ages 2 to 5 with social and emotional problems or significant behavioral concerns. Whereas the DECA is designed to be used with all children to promote healthy social and emotional growth, the primary purpose of the DECA-C is to support early intervention efforts to reduce or eliminate significant emotional and behavioral concerns in preschool children. 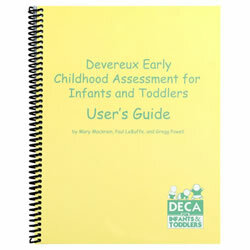 The DECA-C may also be used to guide interventions, help identify children needing special services, assess outcomes, and help programs meet Head Start, IDEA and similar standards. 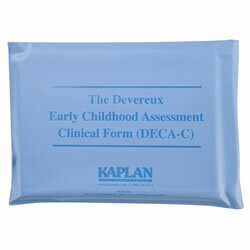 The DECA-C is a 62-item scale that can be completed by either teachers or parents in about 15 minutes. Scoring is made simple by a user-friendly record form. To help ensure proper use of the tool and results, it must be scored and interpreted by a behavioral healthcare or special education professional. A norm-referenced, behavior rating scale, the DECA-C contains all of the protective factors found in the DECA (initiative, self-control, and attachment), but also assesses behavioral concerns such as aggression, attention problems, emotional control problems, and withdrawal/depression. 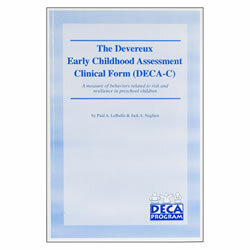 Measuring both a child's strengths and behavioral concerns, the DECA-C provides a balanced description of the child's behavior and allows for strength-based planning and strategy implementation. 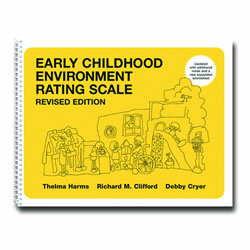 Some of the preceding links are external to Kaplan Early Learning Company's web site. 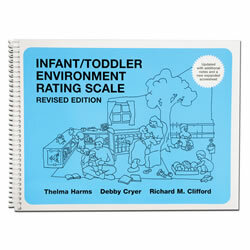 Kaplan Early Learning Company cannot attest to the accuracy of information provided by this site(s). Linking to a web site does not constitute an endorsement by Kaplan Early Learning Company, or its employees, of the sponsors of the site or the products presented on the site. Paul LeBuffe, M.A., is the Co-Director of the Devereux Center for Resilient Children in Villanova, Pennsylvania. He is a graduate of St. Mary's College of Maryland and received his Master's degree in experimental psychology from Bryn Mawr College. Paul is an author of many widely-used assessments of behaviors related to children's social-emotional strengths and needs including the Devereux Behavior Rating Scale - School Form, the Devereux Scales of Mental Disorders (DSMD), the Devereux Early Childhood Assessment (DECA), the Devereux Early Childhood Assessment Clinical Form (DECA-C) the Devereux Early Childhood Assessment - Infant/Toddler Form (DECA-I/T) and most recently, the Devereux Student Strengths Assessment (DESSA.) His major research interests are the measurement and promotion of social-emotional competence and resilience in children, psychometrics and test development, treatment outcome evaluation in behavioral healthcare, and suicide prevention education.